Most of us like to sleep during the night, but that’s also the prime time for bed bug activity. So if you’re trying to confirm your suspicions that you have a bed bug problem, it can be hard to do if you can’t drag yourself out of bed at night to do it. That’s why it’s important to know how to find bed bugs during the day. It’ll be trickier than finding them at night, but with a few tips, you’ll be able to locate the signs that these little pests leave behind. Will Bed Bugs Come Out During The Day To Feed? Bed bugs are the undisputed champions of hide and seek. These little bugs are surprisingly fast. In just one minute, they can crawl three to four feet, which is quick considering their small size. But since they are nocturnal in nature, you won’t see them if you try to strip your bed during the day to look for them. Instead of running around during the day, they’ll be hiding in some of their favorite spots, tucked into places where they’ll be less likely to be found. One of their favorite places to hide during the day is along the folds and seams of your mattress and box springs. They also hide in the baseboards, bedding, and furniture that is near your bed. They don’t like to stray more than a few feet away from their primary feeding area, so your bedroom will be their number one hiding spot. They like to hide in electrical switchplates, wallpaper, and even picture frames. They also have been known to hide in the folds of curtains. When you’re at a hotel, they also like to hide inside of suitcases you put on the floor near the bed. That’s why it’s crucial to check out your surroundings for bed bugs in a hotel before you set your suitcase anywhere near the bed. If you don’t carefully examine your surroundings, you could very well have some stowaways. It’s going to be difficult to find bed bugs during the day. First, to determine if you might have an infestation in your house, you should look for any signs of a live bug or at least indications that they have been there. One of the first things you should do is to make sure you have plenty of light to work with. This is the one silver lining to looking for bed bugs during the day – your bedroom won’t be as dark as it is at night if you have any windows in there. Because bed bugs are so small and so adept at hiding, light is one of the most essential tools you’ll need while looking for them. If you have blinds or curtains in your bedroom, open them up and let that natural light in. Even with that light, it will still help to have a flashlight for the crevices you’ll be looking into. Finally, a magnifying glass would also be a good thing to have on hand. Begin by checking out the crevices of your mattress where the bugs love to hide. If you have a big bed bug problem, you’re likely to see some of them here (alive or dead). If your problem isn’t as severe, you’ll need to keep looking if the mattress crevices come up clean. After checking the mattress crevices, shine your light on your bedframe crevices. That hiding spot will still leave bed bugs close to you and your blood supply so it’s a good one for them to access. After that, check out your baseboards and any crevices you have along your wall. If you still haven’t seen any actual bed bugs, look for signs that they are there even though they are out of sight. Some things you’ll want to look for include eggs, which are tiny so that’s where the magnifying glass comes in handy. 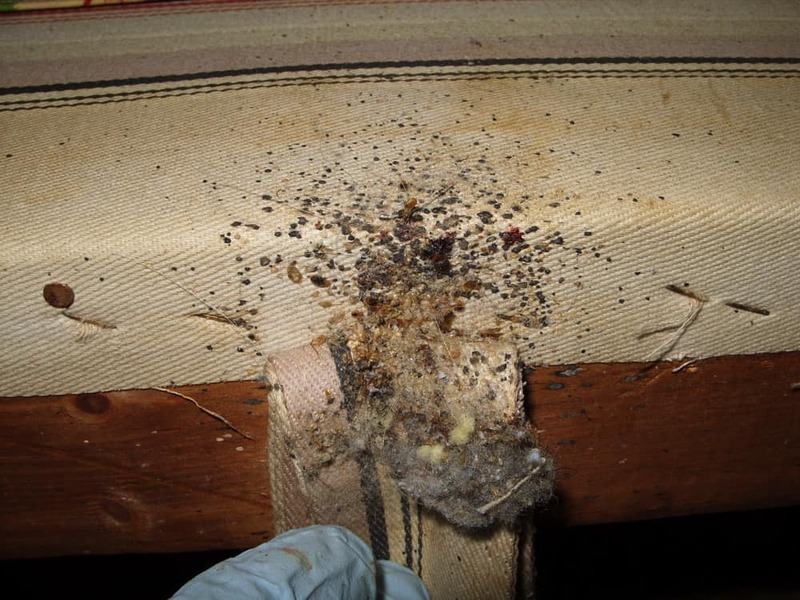 Any brown splatters on your mattress or furniture may be from the excrement left behind by the bed bugs. 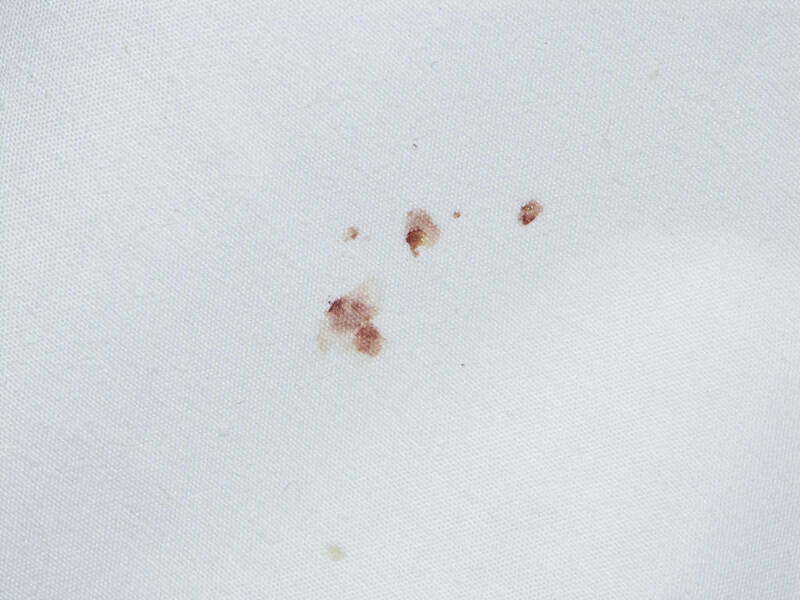 You also might see various bed bug stains, tiny pin pricks of blood on your mattress. These comes from you, as the bed bugs feed on you, and before your wound has had a chance to clot. Sometimes, you'll roll over onto an engorged bed bug in your sleep, causing it to explode and splatter on the mattress. 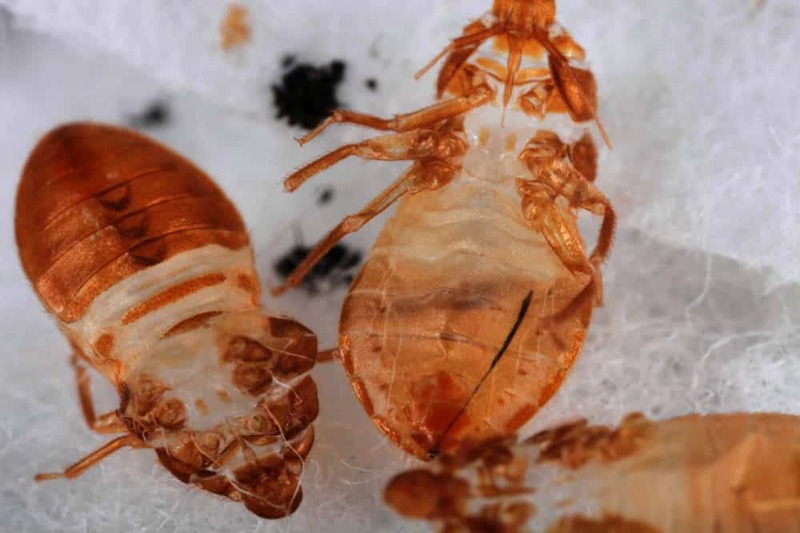 Also, since bed bugs molt their exoskeletons five times when they make their way from nymph to adult, you might see their shed skins on your mattress. The exoskeleton will be translucent and in the shape of a bed bug. Those skins can range in size depending whether it’s the first time they’ve shed their skin or the last, indicating they have reached adulthood. While an egg tends to be somewhere around one millimeter in size, a bed bug skin can be anywhere from 1.5 millimeters to 4.5 millimeters. The other sign you’ll want to keep an eye out for is whether you’ve had any red, itchy marks on your skin lately. Even if you can’t see any other signs of bed bugs while doing a quick inspection of your bedroom, if you have suspected bed bug bites on your skin, you should keep looking. 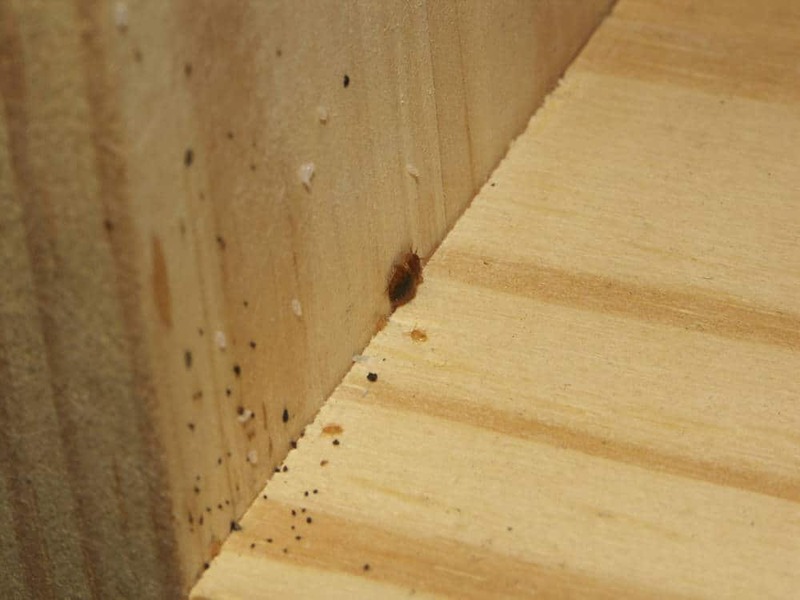 Sometimes, bed bugs can hide in places you'd least expect. For example. if human blood is particularly scarce, they can sometimes resort to biting dogs and other household pets. Therefore, it may be worth checking in and around animal bedding around the home. Finally, if you have a particularly big infestation, large groups of bed bugs can generate a unique and peculiar musty smell that can help draw you to their location. 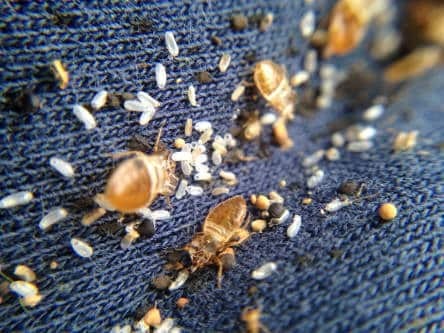 While bedbugs prefer the night for their feeding habits, they’ll rouse themselves whenever a meal is handy. So if you’re working nights, don’t assume that they will leave you alone. While bed bugs typically feed between the hours of 2 a.m. and 5 a.m., they’ll come out of hiding during the day if they are hungry and there is a person sleeping in bed. They’ll be attracted to your body temperature and the carbon dioxide you breathe out. So even if your hours don’t mesh well with theirs, you’re not in the clear. Also, be aware that there are several other insects that look like bed bugs, so make sure you're careful when identifying whatever you may come across during your searches. It’s possible to find bed bugs during the day so you don’t have to burn the midnight oil waiting for them to make an appearance. And the sooner you can determine if you have some unwanted guests living in your home, the sooner you can start the process to get rid of them. How Do Bed Bugs Get Into Your Bed? How Many Eggs Do Bed Bugs Lay? How Long Do Bed Bugs Live After Spraying? Does Ammonia Kill Bed Bugs? How Often Do Bed Bugs Bite? How Long Can Bed Bugs Live Without Air? Does Salt Kill Bed Bugs? Can Bed Bugs Live in Water? How Long Do They Survive? Thanks for letting me know that bed bugs mostly only feed at night. My son showed me some welts on his arm. I think it’s from bed bugs, so maybe I should have a professional come and inspect. I found a bed bug half way up our bedroom wall today. We can’t find any other evidence of them yet though. It was alive and looked like it hadnt had a food source yet. Unfortunately, we got them about this time last year too!! I discovered bedbugs in my living room sofa and loveseat. I hired an exterminator, then I found more bedbugs in the same places a week later. This exterminator was in no hurry to return to fulfill his guarantee, so I hired a new one. 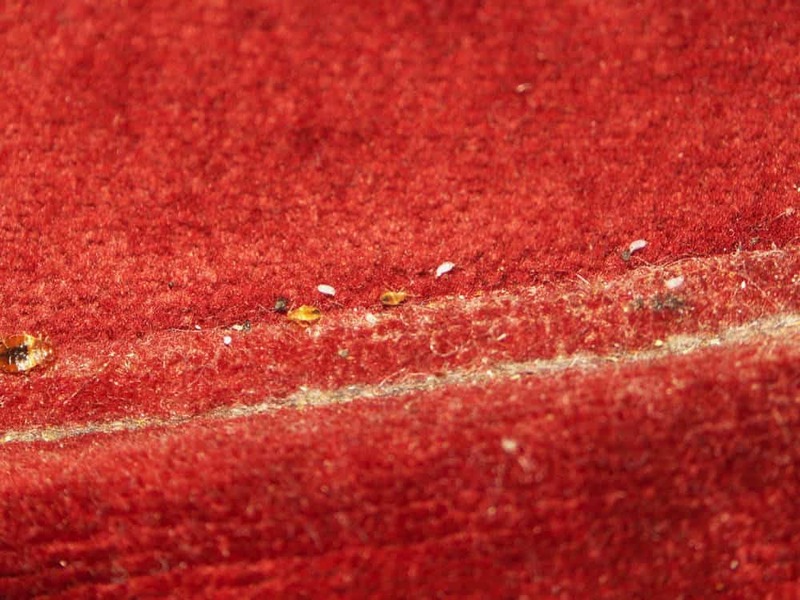 I had my sofa and loveseat removed by professionals and bought new ones…Two weeks later, I’m finding the bugs on the walls, most of them are half dead already. I live in an apartment building and my landlord insists I’m bringing them in myself. I said he had to check the surrounding apartments, so instead of hiring professionals, he sent the super, and only to one of the surrounding apartments. Now he won’t take my calls. I check the apartment myself several times a day and I’m finding one every two days on average. I don’t know what to do anymore. Do Spiders Eat Bed Bugs?